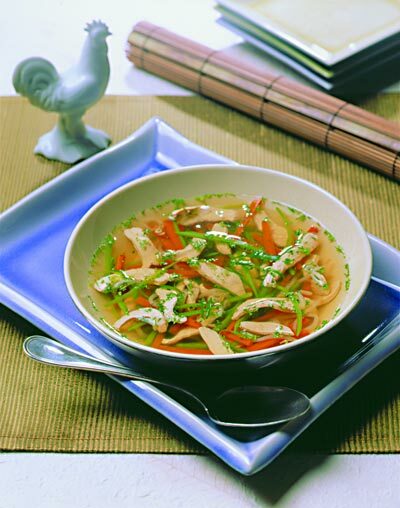 In a large soup pot or dutch oven, place chicken broth, chili paste, garlic, ginger and sesame oil. Bring mixture to a simmer over high heat. Reduce heat to low; simmer 15 minutes. In another large pot, place chicken slices and carrots. Strain heated broth over chicken and carrots. Simmer over medium-low heat for 3 minutes. Stir in snow peas; simmer 1 minute. Stir in scallions, bean sprouts and mint; simmer an additional 2 minutes. Serve hot.